Lynne Nicholson, like many of the women, featured here on Bold Blind Beauty made a few comments, followed the blog, and we developed a friendship. Even though myopia or nearsightedness is very common I’ve not met too many people who share this diagnosis and who’ve also lost eyesight. While Lynne and I are fellow myopes we lost our eyesight to two different conditions tied to our myopia. I learned self-reliance; to trust in my decisions and to know none were final. Finances meant becoming inventive. Sometimes mired in depression, I felt there was no way up and out….. but there was always HOPE. At one low point during a church discussion on mansions in heaven I whispered to a friend “I’d happily take fewer life challenges and a leaky tent”. I’ve been myopic from childhood – the world in soft focus without specs was normality. June 2016 my optician saw an anomaly. My hospital appointment was for almost four months later. My new specs didn’t improve my vision, a continual soft focus was my new normal. My immune system already attacked my platelets and at the end of September 2016, I was diagnosed with Punctate Inner Choroidopathy (PIC) also immunity related—injections could slow down sightloss—but eye doctor wanted to check with blood doctor that blood medication wouldn’t be an issue for the treatment, an appointment would follow—urgency wasn’t implied. However, my current blood doctor left that day and it was two months before I saw the new one. Christmas was coming and it wasn’t until the January I chased up the eye appointment as my eyes definitely seemed to be worse. Two phone calls two weeks apart resulted in an emergency appointment (4 months after diagnosis) in which I learn my left eye is beyond treatment. Five weeks later I registered as sight impaired (9 months after anomaly seen). I struggled to wait for the official help entitled to me nine months exactly after diagnosis I met my ROVI (rehabilitation officer vision impairment). By this time I’d worked out the “in-home” stuff (cooking, lighting, using my smartphone camera to see my surroundings). However, I lacked confidence when out and about since my “dognav” (my pet dog, Tippy) crossed the rainbow bridge. If I got disoriented I panicked without her. I only went out when necessary. Then Wanda Power came into my life. She is my wand of power (white cane) with her I have regained my confidence and much of my independence. I was finally registered Severely Sight Impaired (Blind) 13 months after diagnosis. Of course, there are times I need help after all my clearest vision is four inches in front of my nose. At arm’s length, the blur is such I cannot recognise my daughter if we meet on the street. If I’m going shopping (clothes, household goods or main food shop) I appreciate the help. If I only have a few items to get (to tide me over to the next major shop) Wanda and I go to my local shops. The hardest thing I find is crossing roads but I learn routes that take me to the safest spots to cross even if it means I am not taking the most direct route. Going blind doesn’t make my top ten worst things in my life. Life can knock me down but I always get back up. If I really want to do something I’ll find a way. Everything from Looking back over my life to asking for help isn’t a weakness is my submission. The photo is in boldblindbeauty.com’s WOTM template. 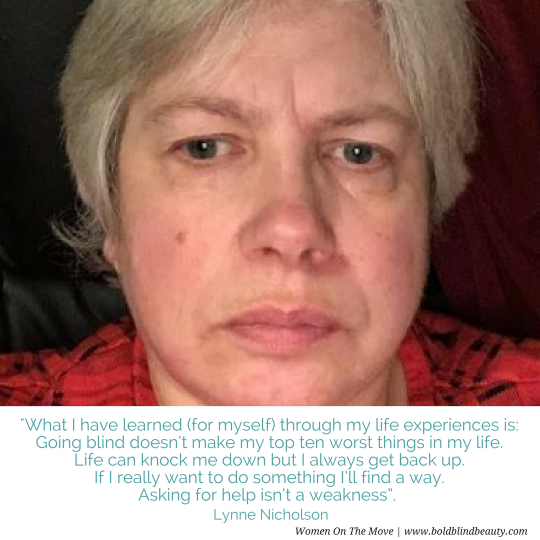 Three-quarters of the template contains the photo and in the bottom portion is Lynne’s quote in teal text. Her attitude towards life is commendable. Thanks for commenting Sarah. Lynne is a gem. Lynne has an amazing attitude. We can all learn much from her. Thanks for sharing her story. – Going blind doesn’t make my top ten worst things in my life. – Life can knock me down but I always get back up. – If I really want to do something I’ll find a way. I know right??? Are you sure we aren’t the same person? This bit I was intending to use for the WOTM quotes, it’s so powerful! Thank you, Diana, for reading and commenting on Lynne’s story. She is such a nice lady with great insight.